From February 2012 until September 2013, I was employed by UCL Museums & Public Engagement Department as Postgraduate Student Engagement Co-ordinator. Beginning in February 2012, a small team of eight research students was established as part of an experimental project to broaden public engagement with UCL research and collections, and to develop audience participation across the museums. Working principally with The Grant Museum of Zoology, The Petrie Museum of Egyptian Archaeology and UCL Art Museum, our aim was to develop new public engagement models through interaction with audiences in these spaces. Following a very successful first year, the project expanded to take on 5 new team members in February 2013. As part of my role as team co-ordinator, I edited and regularly contributed to the group’s blog, Researchers in Museums. Read my posts for UCL Museums and Collections on tattooing and anatomical preservation related themes, or follow @ResearchEngager on twitter. 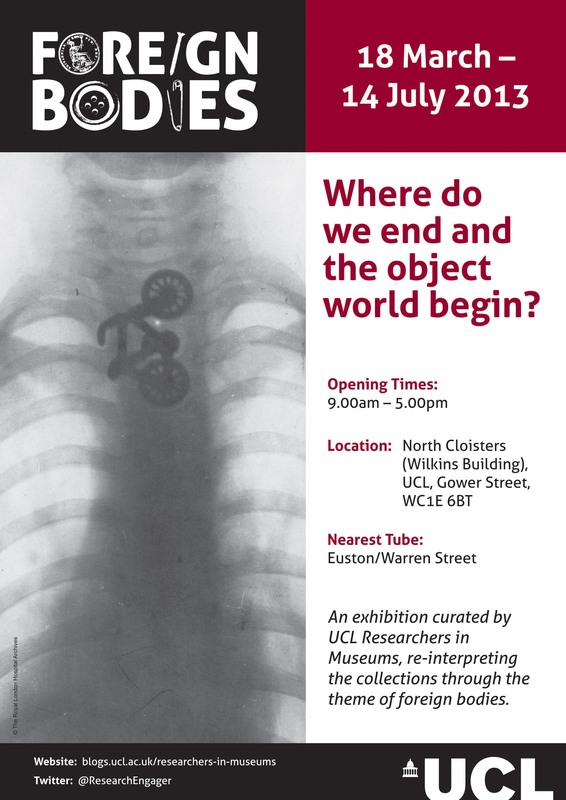 In early 2013, the team curated a cross-collections exhibition at UCL on the theme of Foreign Bodies. The exhibition went on display to the public from March 18th ~ July 14th 2013, and brought together objects from across UCL’s diverse museum and teaching collections, reinterpreted through our own research perspectives. You can find out more about the exhibition here.